As you already know, I have recently embarked on an “eat seasonally” ideology. And as greatly moral as this is, it can be harder than it sounds in a place such as Gibraltar where firstly there isn’t any land to cultivate and grow produce – therefore relying on imported produce – and secondly but more specifically, we don’t really have four seasons. We go from hot to wet to warm again! But who’s complaining?! Considering the glorious summers we enjoy in this region that can sometimes start as early as late April and last well into early November; it is not hard to understand why there can be an abundance of colourful fruits and vegetables on sale at our local grocers and markets; especially towards the end of summer and triumphantly ending their season in autumn. Last to be picked off their trees and vines, and having soaked up every last ounce of summer sun, flesh ripened into sweet nectar; skins full to bursting – it is the purple, deep red to blue-black fruits and vegetables that make their prominence known within these autumn months. Purple foods have become a hot produce colour of late (cranberry juice, pomegranate juice, pomegranate molasses, to name but a few). They contain a phytochemical called anthocyanin, which is responsible to help fight free radicals and some cancers but may also protect against heart disease, diabetes and colon cancer. Purple foods are good at preventing age-related memory loss, keeping the eyes and urinary tract healthy and lowering the risk of gum disease and stomach ulcers. 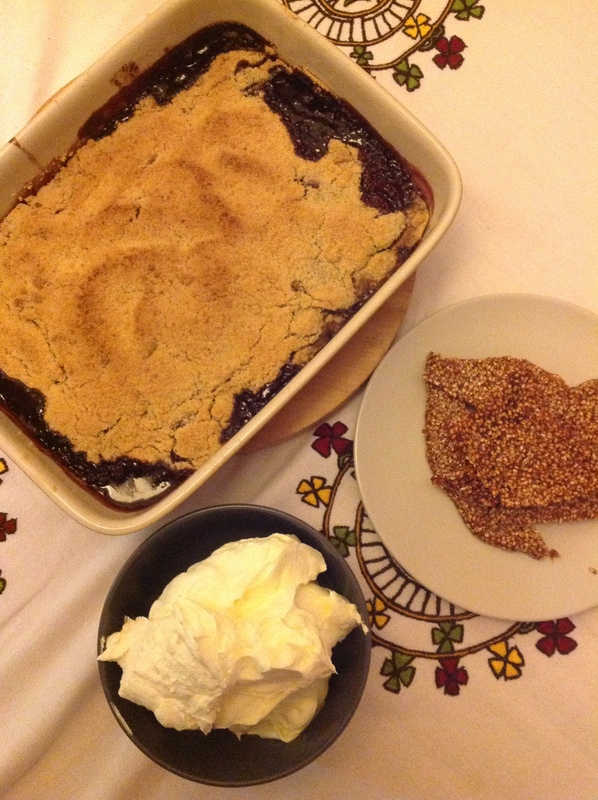 My Purple Plum Crumble is a remarkably easy dessert to make; my nephew’s favourite, and quintessentially autumnal. The scents of cinnamon and nutmeg wafting through the house make this the perfect autumn pudding. Make the crumble first: In a food processor pulse the butter and plain flour (this can be done by hand by fluttering the butter and flour between your fingers and thumb) until the mixture resembles fine breadcrumbs. Add the Demerara sugar to the mixture and place into the fridge. 1st: Preheat the oven to 200˚C. 2nd: Sauté the plums for a few minutes in a hot frying pan with the butter and sugar. 3rd: Add the vanilla, star anise, nutmeg, cinnamon, golden syrup and red wine (I sometimes substitute the wine for port or a mix of water and wine or just water). Bring to the boil and simmer gently for 6 – 8mins. 4th: Once the plums have broken down into a thick, syrupy texture, place into an oven dish and cover with the crumble mixture. (Optional Extra: add flaked almonds to the crumble mix). 5th: Bake in the oven for 20-25 mins or until golden brown. 6th: Allow to cool slightly before serving with double cream or cold vanilla ice-cream or both! I apologise if the mantra ‘Eat the Rainbow’ sounds totally naff; almost as if I’m stealing the Skittles motto but if a handful of blueberries in my brekkie are going to help me against all sorts of ailments then bring them on by the punnet-load! Alternatively, a cheeky glass of red wine a day is also high in antioxidants!